Severe outbreaks of bovine interdigital phlegmon (IP) have occurred recently in several free stall dairy herds in Finland. We studied the aetiology of IP in such herds, and the association of bacterial species with the various stages of IP and herds of various morbidity of IP. Nineteen free stall dairy herds with IP outbreaks and three control herds were visited and bacteriological samples collected from cows suffering from IP (n = 106), other hoof diseases (n = 58), and control cows (n = 64). The herds were divided into high morbidity (morbidity ≥50%) and moderate morbidity groups (9–33%) based on morbidity during the first two months of the outbreak. F. necrophorum subspecies necrophorum was clearly associated with IP in general, and T. pyogenes was associated with the healing stage of IP. Six other major hoof pathogens were detected; Dichelobacter nodosus, Porphyromonas levii, Prevotella melaninogenica, Treponema spp. and Trueperella pyogenes. Most of the samples of acute IP (66.7%) harboured both F. necrophorum and D. nodosus. We found differences between moderate morbidity and high morbidity herds. D. nodosus was more common in IP lesion in high than in moderate morbidity herds. Our result confirms that F. necrophorum subspecies necrophorum is the main pathogen in IP, but also T. pyogenes is associated with the healing stage of IP. Our results suggest that D. nodosus may play a role in the severity of the outbreak of IP, but further research is needed to establish other bacteriological factors behind these severe outbreaks. During recent years, severe outbreaks of interdigital phlegmon (IP) have occurred in dairy herds in Finland, with sudden onset and of divergent morbidity. No preceding clear wound has been detected in the interdigital cleft of the IP cows. These new types of outbreaks have caused serious economic losses to affected dairy farms . IP occurs usually as a sporadic infection of cattle. The herd incidence per lactation is generally 2–5% [2, 3], but studies of earlier outbreaks of IP report incidences of 17–25% during outbreaks [4, 5]. Common signs of IP are lameness; occasionally with an acute onset, a swelling of the interdigital area and the bulbs of the heels, and a fetid odour. A fissure with swollen protruding edges may appear along the interdigital cleft. In severe cases, systemic signs occur, including fever, recumbency, anorexia or decrease in milk production [6, 7]. IP reduces milk yield  and can necessitate early culling of the affected cow [8, 9]. Traditionally, Fusobacterium necrophorum is considered the major infective agent of IP [10–12] and is detected frequently in IP lesions. F. necrophorum is a common animal pathogen, producing several toxins that can injure tissues; leukotoxin, coded for the lktA gene, is considered a major virulence factor in cattle . lktA is unique to F. necrophorum , and its detection has been used in cattle research as a reliable tool for the detection of F. necrophorum . F. necrophorum is classified into two subspecies, necrophorum and funduliforme. Subspecies necrophorum is more frequently encountered in animal infections and in pure culture, whereas funduliforme is found in mixed infections and is considered less pathogenic . In addition to F. necrophorum, several other bacteria such as, Bacteroides melaninogenicus [11, 12], Dichelobacter nodosus , Porphyromonas levii [17, 18], Spirochetes [5, 7], and Trueperella pyogenes  have been suggested to play a role in the pathogenesis of IP. Nevertheless, most of that research was done long ago and, for example, the taxonomical changes since then make interpretation of the results challenging. Also, a recent review describes that the role of various bacterial species in the pathogenesis of IP is still unresolved . Recently the main research focus worldwide has been on digital dermatitis (DD) and treponemes and only a few studies have addressed IP and its bacteriology. However, because of numerous new type outbreaks of IP in dairy herds in Finland, we investigated the bacteriology of IP, including those bacteria earlier suggested to be involved in IP. The aim of the study was to investigate the bacteriology of IP in this new type of outbreaks; at various stages of IP, both acute and during the healing process, and compare the findings with healthy control cows. Moreover, we investigated whether these bacteriological findings differed between herds of various morbidities. During 2012–2015 we carried out a research project on infectious hoof diseases in Finland. As a part of the project, we made several farm visits to privately owned dairy herds affected by outbreaks of IP. Of the farms visited, 19 fulfilled the criteria for an outbreak of IP; at least three observed cases of IP within 1 week, and no previous history of IP in the herd for 10 years. The outbreak herds were later divided into two categories based on the incidence of IP within 2 months of the outbreak. Furthermore, we collected samples from control cows of three non-outbreak herds (IP free herds). All herds studied were housed in free stalls. The average herd size was 75 lactating cows (range 31–140, median 62) and the average milk yield was 9234 kg (8000–10,914 kg, median 9219 kg). The primary selection criteria for inclusion of a cow in the study were lameness, prolonged lying-time, or a ‘trouble report’ from an automatic milking system. In the outbreak herds, we collected samples mainly from cows that had IP, but also from lesions apparently infected with bacteria. Such lesions included DD, interdigital dermatitis (ID), white line abscesses and sole ulcers. The IP lesions were classified as acute IP or healing IP. The diagnosis of acute IP was made if a symmetric swelling and possible ulceration appeared in the interdigital cleft. Healing IP was identified as proliferation tissue or apparent scar formation in the affected region. DD diagnosis was made according to Döpfer et al. . We also sampled 1–5 control cows per IP outbreak herd. These were non-lame cows with no sign of IP, DD, ID, sole ulcer, or white line disease, and are hereafter referred to as control cows (IP herd). In control herds, we sampled 4–8 cows in each herd using the same criteria as for control cows (IP herd). We sampled a single hoof from all control cows, but from 11 cows with IP or DD we took samples from two separate feet. Five outbreak herds were visited 2 or 3 times. During these visits, 10 IP cows were sampled repeatedly 2 or 3 times 11–34 days after the first sampling. These samples were additional and not included in the total number of hoof samples (total n = 228). These resampled IP cows had clinical signs of IP at all sampling times. Table 1 presents the number of study herds of various morbidities, numbers of sampled cows and hoof samples in various disease groups. Of the sampled cows (n = 217) selected for the study, 58.5% were Ayrshire and 41.5% Holstein. Moreover 4.6% were heifers, 41.5% first parity cows, 22.1% second parity, 29.5% third or more parity cows and 36.9% were on early lactation (1–120 days in milk, DIM), 53.0% late lactation (121–305 DIM) and 7.8% were either dry cows or heifers. Information on parity and lactation stage was absent for 5 cows (2.3%). Two veterinarians (MK, RJ) experienced in hoof diseases of cattle, evaluated the general condition and hoof health of the cows prior to sampling and recorded clinical diagnosis and antimicrobial treatment history. Every hoof was photographed at sampling, and diagnoses were standardized between the two veterinarians by evaluating some of the photographs together. The sampling took place in a trimming chute; we lifted the foot up and spread the claws with an extensor. Then we washed the distal foot carefully with a hose, spouted with saline solution, and dried it with gauze. We collected the bacterial samples from the inflamed region using sterile swabs (FLOQSwabs), used them immediately for culturing, and took cytobrush samples from the same region for PCR analysis. We placed the cytobrushes (Medscand Medical Cytobrush Plus, CooperSurgical Inc., Germany) in sampling tubes (Micro tube 2 mL, Sarstedt, Germany) and froze them to – 20 °C in 24 h. We sampled the control cows similarly from the interdigital cleft. All bacterial samples in this study are hereafter referred as hoof samples. If needed, the farm veterinarian treated IP and DD cows with severe signs after sampling. During the farm visits, we set up a field laboratory at the farm. It included culture media, disposable plastic loops (10 μL, Mekalasi Oy, Helsinki, Finland) and equipment to maintain anaerobic conditions. Fastidious Anaerobe Agar, FAA (LabM, Lancashire, UK) and Fusobacterium Neomycin Vancomycin, NV agar  were used for primary culture. NV media were provided by Kokkola laboratory ((Maintpartner OY, Kokkola, Finland) or the Finnish Food Safety Authority (Evira, Helsinki, Finland). Agar plates were prereduced in Genbox containers (Biomerieux, France). The agar plates were sealed to maintain anaerobic conditions (BD GasPak EZ, Becton, Dickinson and Company, USA and GENpag anaer, Biomerieux, France) within 2 hours of sampling and incubated anaerobically for 2 days at 37 °C. From cultures we picked greyish, umbonate colonies of various shapes and sizes typical of spp. necrophorum, and smaller, yellowish, and waxy colonies typical of spp. funduliforme. Both colony types expressed strong beta-haemolysis on FAA and NV agars. The colonies were identified using conventional bacteriological methods to species and subspecies level , and verified using PCR assays for lktA and haemagglutinin (Table 2). Isolates were stored below − 70 °C for further characterisation. Total DNA was extracted from cytobrush samples with Qiagen Blood and Tissue Column kit (Qiagen Gmbh, Germany) following the manufacturer’s instructions. The samples were eluted in 100 μL EB and stored at − 20 °C. An aliquot of 2 μL was used as a template for PCR amplification. Bovine DNA in the preparations did not block the detection of bacterial target DNA by PCR. The PCR assays are listed in Table 2. The PCR analyses were performed at the Finnish Food Safety Authority Evira. Of the 228 samples analyzed, 205 samples were successfully amplified. The PCR assays, oligos and conditions for PCR are shown in Table 2. PCR reactions consisted of 0.5 μM of each oligo, 200 μM dNTP (Thermo Fisher Scientific), 1.0 U Dynazyme polymerase, 1.5 mM MgCl2 and 2 μL template in Dynazyme F-511 buffer (Thermo Fisher Scientific). PTC Thermal cycler (Thermo Fisher Scientific™) was used for ampilification. For lktA gene, the thermal profile consisted of 95 °C for 2 min followed by 35 cycles of 95 °C for 30 s, 60 °C for 30 s, 72 °C for 40 s, with a final extension at 72 °C for 5 min. For haemagglutinin gene, the thermal profile was 95 °C for 2 min, followed by 35 cycles of 95 °C for 30 s, 55 °C for 15 s and 72 °C for 30 s, with a final extension at 72 °C for 5 min. The PCR products were separated and visualized using electrophoresis and SybrSafe in 1.5% agarose gel. The PCR analyses were performed at ThermoFisher Scientific Vantaa, Finland. Control (IP herd and IP free herd) and IP samples (n = 142) were analysed. All PCR reactions contained 0.5 μM of primers and 0.25 μM of probes in 20 μL of final PCR volume. QuantStudio 5 Real-Time PCR System (Thermo Fisher Scientific™) was used for thermal cycling. The thermal profile consisted of 95 °C for 10 min followed by 40 cycles of 95 °C for 5 s, and 60 °C for 1 min. In-house programs were applied to design qPCR oligo sequences for P. levii and P. melaninogenica used in this study (Table 2). Inclusivity and exclusivity were confirmed in silico using all RefSeq (NCBI Reference Sequence Database) bacterial genomes as reference sequence data. Commercial genomic DNA (gDNA) stocks from P. melaninogenica DSM26980 and P. levii DSM23370 were measured using a Qubit Fluorometer (Qubit® 2.0 Fluorometer, Thermo Fisher Scientific™) and gDNA copy numbers were calculated using DNA Copy Number and Dilution Calculator (Thermo Fisher Scientific™). Both oligo sets were multiplexed with an internal amplification control (IAC) oligos and template DNA (eliminates false-negative results due to inhibition of the reaction) and compared to the singleplex reactions using a genomic DNA dilution series in triplicate. Amplification efficiency for both oligo sets was calculated from the multiplex reactions. No-template controls (NTC) were run with each multiplex to screen potential oligo cross-reactions. Sensitivity of the oligo sets was tested using a doubling dilution series of genomic DNA in 8 replicates. Specificity of both oligo sets was tested using the non-target panel of several bacteria. DNA samples were analysed with the two oligo sets using 2 μL of DNA. Positive controls and NTC’s were included into each run. The PCR analyses were performed at Denmark Technical University. Altogether 168 cytobrush samples had enough DNA for the analysis. An initial PCR step using a universal bacterial oligo pair encompassing most of the 16S rRNA gene  was followed by nested PCR analysis using oligos specific for the three DD Treponema phylogroups as described by Evans et al. (Table 2). In all PCR assays, a 25 μL reaction mixture contained 1.25 U AmpliTaq DNA polymerase (Applied Biosystems, CA, USA), 1.5 mM (universal oligos) or 3 mM (group specific oligos) MgCl2 Solution (Applied Biosystems, USA), 100 μM of each dNTP (Amersham Biosciences, NJ, USA), 0.2 μM of each specific oligo, and 1 μL of the template in PCR Buffer II (Applied Biosystems, USA). Thermal cycling was performed in a T3 thermocycler (Biometra, Göttingen, Germany) as described by Evans et al. . In each assay, water served as a negative control, and genomic DNA from each of the three Treponema groups as positive control. PCR products were separated on a 2% E-gel (Invitrogen, Carlsbad, 92,008 CA, USA), and visualized by UV fluorescence. The following type strains were used as controls in the PCR assays: D. nodosus ATCC 25549, F. necrophorum ssp. necrophorum ATCC 25286, F. varium ATCC 8501, F. necrophorum ssp. funduliforme DSM 19678, T. pyogenes ATCC 19411D, P. levii (DSM23370) and P. melaninogenica (DSM26980), T. vincentii (ATCC 35580), T. phagedenis (ATCC 27087) and T. denticola (ATCC 3320). Our own Arcanobacterium haemolyticum isolate served as a negative control for T. pyogenes pyolysin. The bacteriological results and data recorded during the herd visits were entered Excel spreadsheets and the statistical analyses were carried out using Stata IC version 15.0 (Stata Corporation, Texas, USA). A p-value of < 0.05 was considered statistically significant. The repeated samples were excluded from statistical analyses. Two groups of cows served as controls in our study; control in IP free herd (n = 19) and in IP herd (n = 45), and were tested for statistical difference using chi square. All hoof samples were divided into four disease categories; 1) control, 2) acute IP, 3) healing IP, and 4) other hoof diseases. Antimicrobial treatments were divided into three categories; 1) no current or previous antimicrobial treatment during last month, 2) current antimicrobial treatment or treatment within 6 days before sampling and 3) previous treatment with antimicrobials within 7–30 days prior to the sampling. The outbreak herds (n = 19) were divided into two categories 1) herds of high morbidity; ≥50% of the cows having IP and 2) herds of moderate morbidity; 9–33% of the cows with IP during the first 2 months of the outbreak. No herds had morbidity between these figures. The effect of antimicrobial treatment to each bacterium was tested separately with a logistic regression model. The dependent variable was each bacterium separately and independent variables were disease categories 1–4 and antimicrobial treatment categories 1–3. Herd was included as a random factor in these models. The possible association of culture results of fusobacteria and IP were tested using chi-squared test. The possible association of bacteria in IP samples and high or moderate morbidity outbreak of IP were tested using Fisher exact test; only cows without antimicrobial treatment were included in the analysis. We studied the association of disease categories and various bacteria (n = 6) in a multinomial logistic regression model. The herd had no effect on the results and was not included to the final model. The outcome of the model was disease categories (control, acute IP, healing IP) and variables were F. necrophorum, D. nodosus, T. pyogenes, Treponema, P. levii and P. melaninogenica (all dichotomous, no presence/presence). The group of other hoof diseases was excluded from this analysis. F. necrophorum ssp. 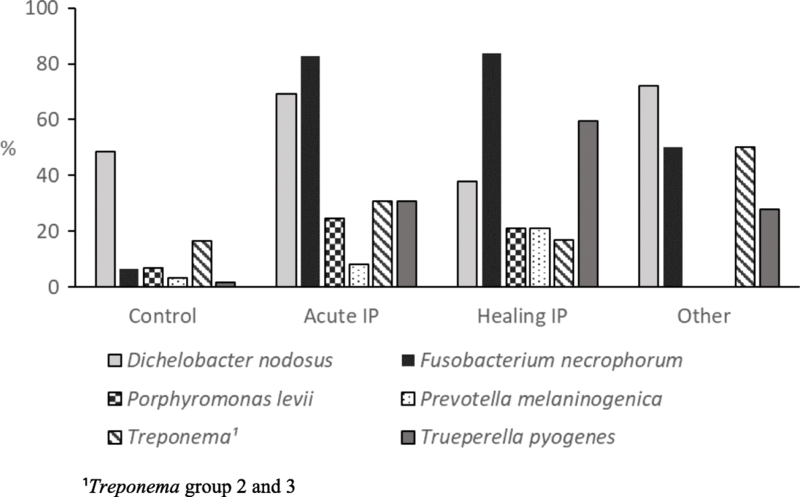 necrophorum was detected by culture in 48/65 (73.8%) of the samples from acute IP and in 26/41 (63.4%) from healing IP and was clearly associated with IP (p < 0.01) when both IP groups (n = 106) were combined and compared with controls (n = 64). All the F. necrophorum isolates, including both subspecies necrophorum and funduliforme, possessed the lktA gene. 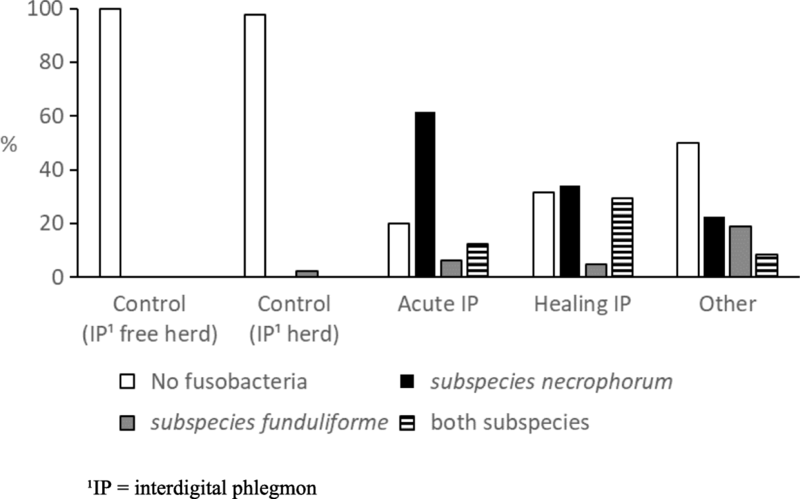 Figure 1 shows the prevalence of cultured fusobacteria in various disease categories; control cows (IP free herd, n = 19), control cows (IP herd, n = 45), acute IP (n = 65), healing IP (n = 41), other hoof diseases (n = 58). The group of other hoof diseases (n = 58) included samples from cases of DD, ID, sole ulcer and white line abscesses. In 20 DD samples, F. necrophorum ssp. necrophorum was detected in 7 (35.0%) samples. In other hoof diseases, including ID, white line abscesses and sole ulcers, ssp. necrophorum was detected in 11/38 (28.9%) of the samples. The resampled hooves were culture negative for F. necrophorum ssp. necrophorum in a first sampling, but both were positive subsequently. One sample was positive at both samplings and seven samples were negative at the second sampling. One cow was sampled three times and after being positive for F. necrophorum ssp. necrophorum at the first sampling, it was negative at the second and positive at the third sampling. All cows except one were treated with antimicrobials between sampling times. We obtained PCR results for D. nodosus, F. necrophorum and T. pyogenes from 205 hoof cytobrush samples, P. levii and P. melaninogenica from 142 and Treponema from 168 samples. Figure 1 shows the number of successful PCR tests in each disease category. Of 168 Treponema samples, 93 (55.4%) were positive for universal Treponema primer. None of the samples was positive for Treponema group 1 (T. medium/ T. vincentii-like). However, 28/168 (16.7%) were positive for Treponema group 2 (T. phagedenis-like) and 16/168 (9.5%) for Treponema group 3 (T. putidum/ T. denticola-like). Treponema group 3 was always detected simultaneously with Treponema group 2. Of these 16 samples were 4 acute IP, 3 healing IP, 8 DD and 1 other hoof disease. D. nodosus was detected from 9/19 (47.4%) control cows (IP free herd) and 21/43 (48.8%) control cows (IP herd), F. necrophorum was detected in 0/19 (0%) and 4/43 (9.3%) of samples, P. levii in 1/19 (5.6%) and 3/41 (7.3%), P. melaninogenica in 0/19 (0%) and 2/41 (4.9%), Treponema group 2 and 3 in 4/19 (21.1%) and 6/42 (14.3%), and T. pyogenes in 1/19 (5.3%) and 0/43 (0%). No statistical differences were evident between the control groups regarding the bacteria detected and therefore data for each control group were combined for statistical analyses. Figure 2 presents the results of PCR analysis for various disease categories; control cows (n = 62), acute IP (n = 52), healing IP (n = 37), and other hoof diseases (n = 54). P. levii and P. melaninogenica were not analysed among the group of other hoof diseases. Several bacterial species were detected by PCR in numerous hoof samples (Table 3). The control cows were either PCR negative (26/59; 44.1%), or harboured D. nodosus alone (16/59; 27.1%) or in combination with Treponema group 2 and 3 (9/59; 15.3%). In most acute IP samples (24/36; 66.7%), F. necrophorum and D. nodosus were detected. They occurred with P. levii (4/36; 11.1%) or Treponema group 2 and 3 (4/36; 11.1%), and F. necrophorum alone was combined with T. pyogenes (4/36; 11.1%). For the healing stage of IP, the most frequently detected combinations were F. necrophorum and T. pyogenes (6/33, 18.2%), F. necrophorum alone (3/33; 9.1%) and F. necrophorum, T. pyogenes and P. levii (3/33, 9.1%). We investigated the association of control samples, acute IP, and healing IP with the bacterial species detected by PCR (Table 4). F. necrophorum was associated distinctively with both stages of IP (p < 0.01). T. pyogenes was found more often with the healing IP (p = 0.01), but only a trend existed in the group of acute IP samples. Antimicrobial treatment affected detection of D. nodosus (current treatment OR = 0.2, p = 0.01, previous treatment OR = 0.1, p < 0.01) and Treponema group 2 and 3 (current treatment OR = 0.1, p < 0.01, previous treatment OR = 0.1, p = 0.03), but not detection of other bacteria. Of 19 outbreak herds, in 7 herds the morbidity was high (morbidity ≥50% during first 2 months of the outbreak) and 12 herds moderate (morbidity 9–33%). No herds had morbidity of 34–49%. We found no differences in detected bacteria in control samples of herds of various morbidity. We focused on acute IP samples and compared their bacteriology between these 7 high morbidity herds and 12 moderate morbidity herds. Bacterial species detected by PCR in hoof samples from acute IP in high and moderate morbidity herds are presented in Fig. 3 and combinations of bacterial species detected in Table 5. First, we analysed the association of culture results of fusobacteria in various morbidity herds. The presence of 2 F. necrophorum subspecies in acute IP samples from high (n = 31) and from moderate morbidity herds (n = 34) did not differ (p = 0.24); of these samples, no fusobacteria were detected in 9 (29.0%) samples from high and in 4 (11.8%) samples from moderate morbidity herds. Subspecies necrophorum was detected in 18 samples (58.1%) from high and in 22 (64.7%) samples from moderate morbidity, ssp. funduliforme in 2 samples from both morbidity groups (6.5 and 5.9% respectively), and both subspecies in 2 samples (6.5%) from high and in 6 (17.7%) from moderate morbidity herds. Subsequently we compared the association of other bacteria in various morbidity herds; presence of D. nodosus, F. necrophorum, P. levii, P. melaninogenica, Treponema group 2 and 3, and T. pyogenes detected by PCR in acute IP samples from high and moderate morbidity herds is presented in Fig. 3. The most common combination, F. necrophorum and D. nodosus, was found in 14/17 (82.4%) samples of acute IP from high and 10/19 (52.6%) samples from moderate morbidity herds (Table 5). D. nodosus was more often detected in IP in high than moderate morbidity herds (p = 0.05, n = 35). F. necrophorum was found in this study as the main pathogen in IP. This is in line with previous studies [10–12]. Based on our results, it was ssp. necrophorum that was clearly associated with IP. We also detected F. necrophorum in DD and in other hoof diseases, but less frequently than in IP. Similarly, fusobacteria are detected in DD lesions in other studies [22, 23]. F. necrophorum is a normal inhabitant in the rumen of cattle . Occasionally, it can be detected in the faeces, and thus it contaminates the environment . In a study of DD microbiome, small number of fusobacteria were detected on healthy hooves . Similarly, in our study F. necrophorum ssp. necrophorum was not detected on the skin of healthy hooves, even when a severe IP outbreak was evident in the herd. This indicates that F. necrophorum does not colonize the intact skin in large numbers. A moist environment or possible trauma has been mentioned as predisposing factors for IP in previous studies [7, 27]. Interestingly, in most of our acute IP study cows no hoof trauma was visible. In most of the study herds the free stall was also reasonably new and well-managed. As a result, we can speculate that F. necrophorum may have to interact with other bacteria to invade to the subcutaneous tissue in the interdigital cleft. Unexpectedly in repeated sampling, fusobacteria were cultivated from IP lesions even though cows had been treated with antimicrobials and IP was at the healing stage. The clinical signs appeared to diminish after beginning of antimicrobial treatment, but F. necrophorum remained in the affected region. However, our bacteriological methods were not quantitative and therefore, we do not know the number of detected bacteria and whether the amount had diminished or not. In a small pilot study of outbreaks of IP in two herds, susceptibility of 27 F. necrophorum isolates to penicillin, tetracycline, cefuroxime and cefotaxime was determined by E-test. All isolates were found susceptible to tested antimicrobials . Also other study reports that antimicrobial resistance is not characteristic of F. necrophorum in IP . We detected D. nodosus from healthy hooves, IP and other hoof diseases. In most of the acute IP samples (66.7%), both F. necrophorum and D. nodosus were detected. A significant association was established with the presence of D. nodosus in IP lesions and high morbidity outbreak in the herd. This could indicate that the presence of D. nodosus affects the severity of IP. D. nodosus is associated with ID  and DD [30–33] and detected in healthy hooves . It is hypothesised that D. nodosus could break down the epidermal barrier, creating a suitable environment for secondary invaders . A recent study also suggests D. nodosus as a potentially important pathogen in DD . Our qualitative investigation does not take account of the numbers of bacteria, which might differ in IP lesions compared with healthy hooves. P. levii and T. pyogenes are detected with F. necrophorum in various cattle infections and evidence of interactions and possible synergism between these species is reported [34–37]. IP is induced using field strains of F. necrophorum and B. melaninogenicus ; the latter is reclassified as several Porphyromonas and Prevotella species . Moreover, in other studies these bacteria are detected in IP samples [17, 18]. In addition to IP, P. levii is detected in DD lesions  and in an outbreak of necrotic vulvovaginitis . Also, T. pyogenes is reported to occur in IP lesions [7, 11, 18]. In our study T. pyogenes was associated with a healing stage of IP and only a trend existed with acute IP, indicating that this pathogen has a secondary role in IP. Nevertheless, we were unable to establish an association between high morbidity and P. levii or T. pyogenes. There are very few studies of the occurrence of treponemes in IP, but many concerning DD. Earlier studies revealed occurrence of Spirochetes in IP lesions [5, 7] but it remains uncertain whether the organisms were treponemes or not. Treponemes are regarded as the most important pathogens in DD [19, 22, 26, 39], and have been detected also in other hoof lesions, including toe necrosis, sole ulcer and white line disease [40, 41]. In our study, we detected Treponema group 2 and 3 in all disease categories, but more frequently in IP and in other hoof diseases; mainly DD. Interestingly all observed DD lesions were detected in herds of moderate morbidity (data not shown). To date ID and DD are not represented a major problem of cattle in Finland . Of 217 cows sampled, 66 (30.4%) were currently being or had previously been treated with antimicrobials. It would have been unethical to leave the affected cows untreated until the sampling visit took place. Nevertheless, the possible effect of an antimicrobial treatment was taken into account in the analysis. In the current study, we investigated several bacteria in new type of outbreaks of IP and possible bacterial dissimilarities in herds with various morbidity. We could detect all studied bacteria in IP lesions either alone or in various combinations but observed bacteriological differences in herds with various morbidity. The most substantial finding was the presence of F. necrophorum in IP lesions, and T. pyogenes at the healing stage of IP. Our results also suggest that D. nodosus may play a role in the severity of the outbreak of IP. It is also quite apparent that a correct diagnosis of IP cannot be made based on a single bacteriologic sample without a clinical inspection. Virulence factors of F. necrophorum isolates and transmission of hoof pathogens among and within farms may represent an important subject that merits further research. The authors thank the study farms and veterinarians, hoof trimmers and others who helped during the farm visits, Taina Lehto and Merja Pöytäkangas at the University of Helsinki for DNA isolation and Tiina Karla, Milja Tikkanen and Laura Vaahtoranta at Thermo Fisher Scientific Vantaa for PCR analysis of Porphyromonas and Prevotella species. This study was financially supported by the Ministry of Agriculture and Forestry project (2066/312/2011) for infectious hoof diseases in new free stalls in Finland. Valio Ltd., the Mercedes Zachariassen Foundation, the Finnish Foundation of Veterinary Research and Helsinki University doctoral programme in Clinical Veterinary Medicine are acknowledged for their financial support in the analysis and interpretation of data and the writing of the manuscript. All authors participated in planning the study. MK, RJ, HS and MKW took the hoof samples. EM, ES and KK performed the cultivation and PCR of the study samples. MK and HS performed the statistical analyses and MK drafted the manuscript. All authors commented, read and approved the final manuscript. Our study protocol was reviewed and approved by the Viikki Campus Research Ethics Committee of Helsinki University in 2012. A written informed consent to use the animals in our study was obtained from the owners of the study herds before sampling.